Invited by MURAKAMI, my friend and colleague in karate, we travelled from May till June in Europe. It was rather a jaunt, and the warm reception of the friends of every country profoundly touched me and left me an unforgettable recollection. Actually, I had the apprehension to pass one month in foreign countries among which the languages, the customs and the climates are so different from mine, notably food. All these concerns volatilized from the first steps in France. Received by friendly and welcoming persons, we spent our first night in Europe in a luxurious apartment near the Place de L’Etoile [in Paris] of one of the pupils of MURAKAMI, to whom moreover we were accommodated during our stay, surrounded with benevolence and in a family atmosphere. 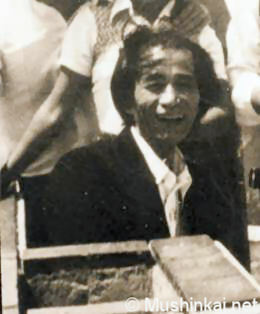 Every day, alternately, companions of karate took charge of us, some young people, some less young, each put of the best will, without forgetting my friend MURAKAMI who lives for a long time in France. I have no word to express my profound gratitude to the friends among whom I felt a real communication of spirit by the practice of karate. All this because I am practicing karate? What does that mean “to practice”? What is "Karate-Do"? What is the "Do" ( the path)? There was no border, all the more no race, or professional or social differences between the friends bound by the "Do", I absolutely had no impression to meet foreigners for the first time. J I say it and write it in every occasion, the purpose or the end of the practice is no other than real communication, that is to reach a state of mind in which to feel the body united with others. Expressed like that, it is possible that you have doubts, but was it not the expression of the heart, united bodies, the sympathy of friendship by the practice of karate, when persons whom you see for the first time receive you in a so friendly way? Practice, I always say, is to think, to imagine and to express teachings of our seniors. Physical contact has to create spiritual correspondence and your body will capture the spirit of your partner. In the Dojo, it brings to take "Sen" and expresses itself by indulgence and understanding in life. Everywhere in Europe, I was received with this spirit that I consider as the final image of practice during an entire life. The practice does not exist only in exercises performed in the Dojo. In Far East (including Japan), there is a saying "Soku-Ze-Dojo" which means "wherever you are, and whenever, every moment is an exercise and every place is a Dojo". In this sense, Europeans are real students of Karate-Do and authentic seekers of the path. I had opportunities to attend big assemblies and trainings in France, Italy and Portugal. At first, I was struck by their sincerity. Thire eyes were those of truth seekers. During a seminar, I was moved by their desire so burning and deep to look for the truth. Regarding details of the technique, it is rather normal that it is not yet perfect, but the technique can improve in time and with good advices; it is not a fundamental problem. The main part is spirit, attitude. I have a big hope in the future of Karate-Do in Europe, and I am anxious to thank MURAKAMI who steered it until today. What process brought "competition" to become the world tendency, by wishing only fights? I wish that we think about the evolution of karate. From "Yakusoku-Kumite" to "Jiyu-Kumite", from "Jiyu-Kumite" to fighting, and that we find the best way of practicing karate. It is not about a comparison, it is necessary to find the best! 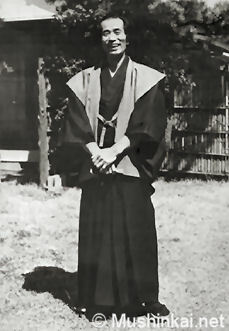 More than half a century ago, “Karate” of Master FUNAKOSHI became "Karate-Jutsu", then "Karate-Do", which is, nowadays, Karate-Do as practiced worldwide. Let us think of this progress once again and let us think about the word of our Master: "there is no fight in Karate-Do". With a view to arriving at the absolute truth, let us walk together to establish the world over the fights, in the sincere and burning practice that will open the road of Karate-Do, not as a lethal weapon, but as weapon of life.